SOCHI, February 15. /TASS/. 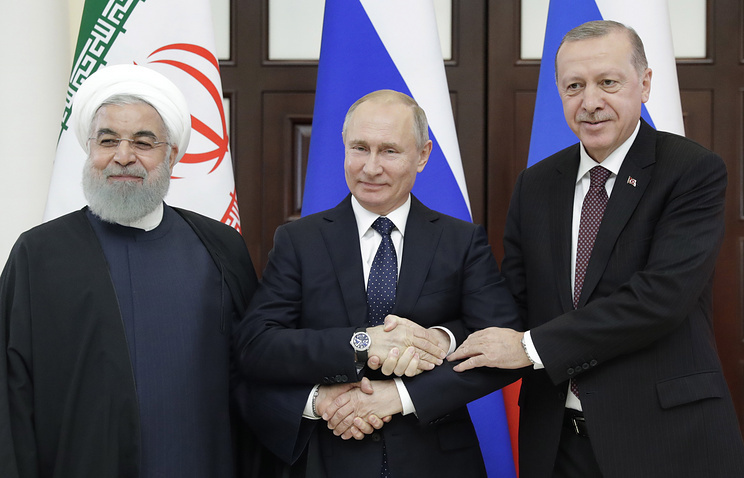 The presidents of Russia, Turkey and Iran adopted a joint statement following their trilateral summit in Russia’s Black Sea resort city of Sochi to reaffirm their commitment to sovereignty and territorial integrity of Syria. The three-page 17-point document sums up the developments which took place in Syria since the three leaders' previous meeting in Tehran in September 2018. The sides stressed their determination to intensify trilateral coordination in line with the existing agreements and reaffirmed their "firm and unchanged commitment to sovereignty, independence, unity and territorial integrity of the Syrian Arab Republic", as well as to goals and principles enshrined in the UN Charter. The three nations also "reject all attempts to create new order of things ‘on the ground’ under the guise of fighting against terrorism." Therefore, they express their readiness to counter separatist plans intended to undermine the sovereignty and territorial integrity of Syria, as well as the national security of the neighboring states. Besides, the sides held a detailed discussion on the situation in the Idlib de-escalation zone, condemned attempts by the Heirat Tahrir al-Sham terrorist group to establish control in the area and agreed to efficiently counter those attempts. The three leaders also agreed to take practical measures to reduce tensions in the Idlib de-escalation zone by fully implementing the existing agreements in this sphere, including the September 17, 2018 memorandum on stabilization in Idlib. "The Syrian conflict has no military solution and can be settled only through a political process, led and implemented by Syrians themselves with the UN assistance, in line with UN Security Council resolution 2254," the document reads. The sides also welcomed the successful prisoner swaps, held on November 24, 2018, and February 12, 2019. Besides, the three leaders also stressed the importance of continuing efforts to deliver humanitarian aid to all civilians, to help the country return to peaceful life and to create conditions for safe return of displaced persons.